Photos from Alan Bockla's racing days cover a wall of his apartment at Everett Plaza. 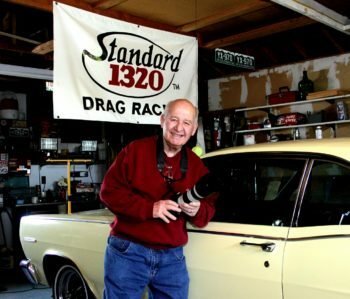 Bockla, who was inducted into the 2013 National Hot Rod Hall of Fame, still gets a sparkle in his eye when he talks about his glory days on the track. As a teenager, Alan worked in his father's retail outlet and machine shop, F&M Auto Parts, in Denver. He later bought it from his father and operated it for many years until his retirement. 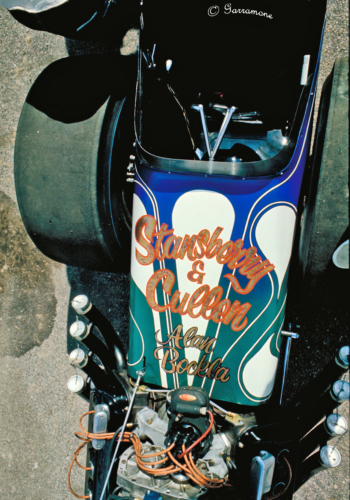 Alan Bockla used to put on fireproof underwear and blast down racetracks at record speeds. 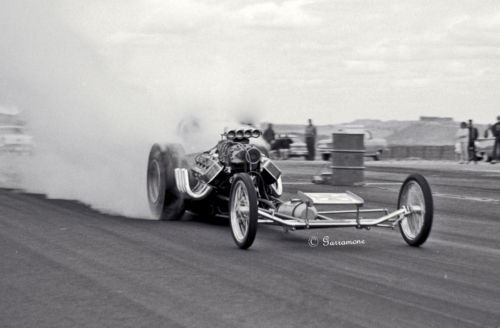 Handsome, fearless and a bit of a showoff, he was drag racing's "King of the Rockies." 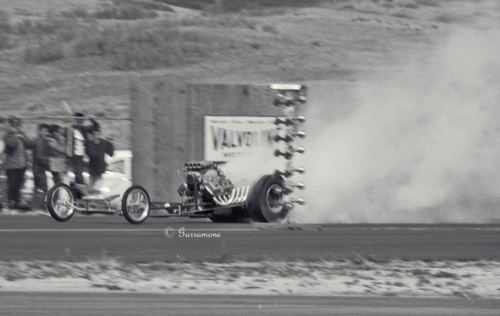 Popping wheelies in his hot rod was his trademark, driving crowds wild. Now he steers a motorized wheelchair with shaky hands and that same daredevil moxie. "There's one spot on the hill by the alley if I hit it just right I can get the wheels off the ground," he said. Bockla, 74, has Parkinson's disease. "It's like a car with a battery that's all corroded and not getting a good connection," he said. "I lost the connection to my brain." 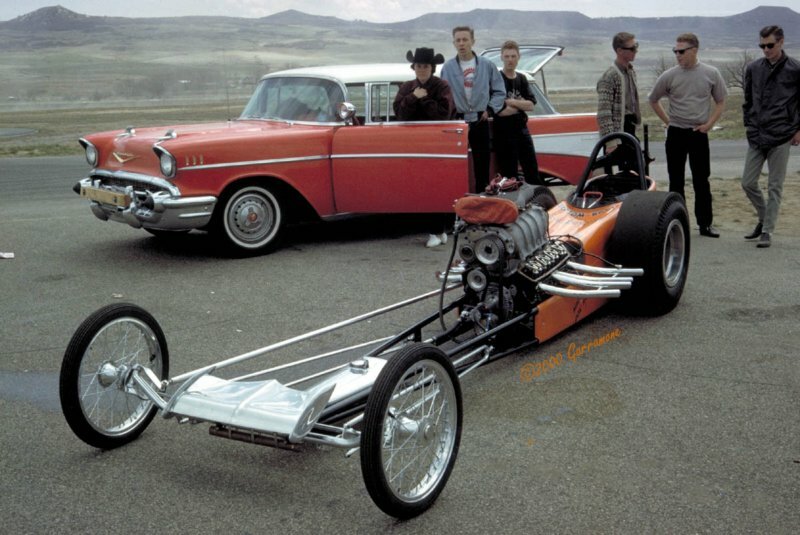 The Denver native was recently inducted into the 2013 National Hot Rod Hall of Fame. 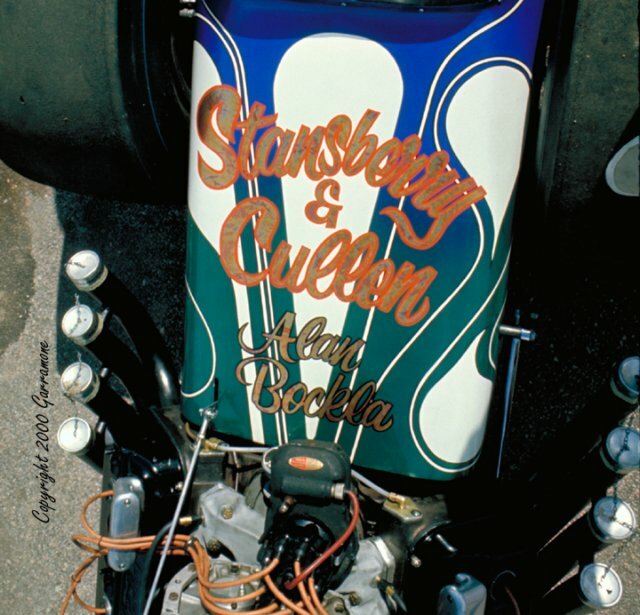 His restored "Alan Bockla" race car is a favorite in shows and nostalgia drags. 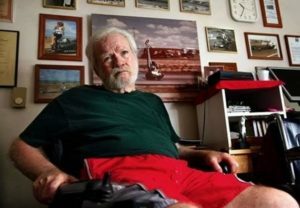 Bockla's name is well-known in the national racing circuit, but in the streets of Everett, the former dragster king is just another white-haired guy in a wheelchair. He lives in an Everett assisted living complex and for recreation takes a paratransit bus to a downtown activity center for adults with disabilities. "Bingo," he said. "When I win." The June 2013 issue of National Hot Rod Association magazine has a two-page spread honoring Bockla. Black-and-white snapshots freeze the man with dark wavy hair and a squinty smile in moments of glory: Flaunting trophies. Hugging his young daughter. Hamming it up with his mascot, a Great Dane named Nando. Bockla stares intently at the brazen young man in the photos. "Doesn't even look like me now, does it?" he said. "I was about 24 years old in those pictures. A lot of water under the bridge." His voice is gravelly. His legs tremble. His head jerks in sweeping movements like a clock pendulum. But the spark in his blue eyes takes over when he talks about cars. Anything cars. "My dad had the first speed shop in Denver. I had my own car when I was 14. I drove to school and got in trouble," he said. Trouble. Yeah, this guy was trouble. Easy to picture that, even now. Bockla was a pro racer for about 10 years. 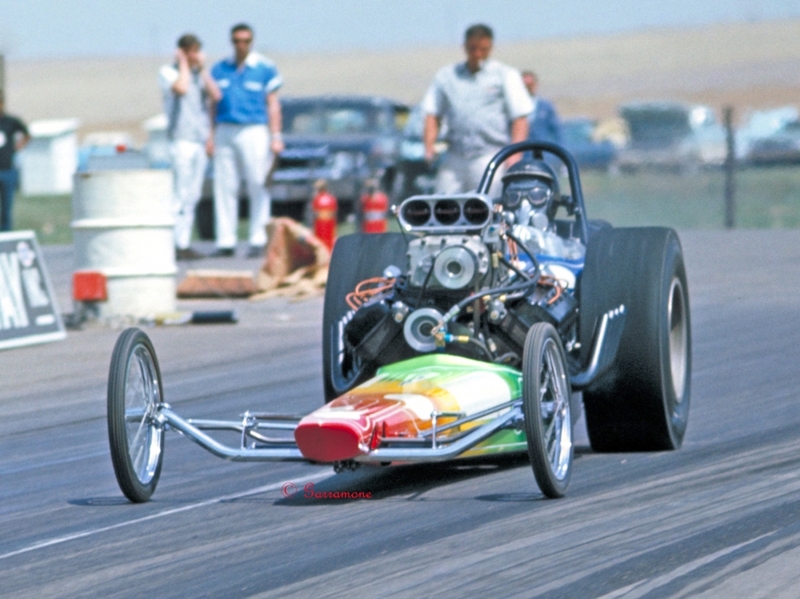 He set six Colorado speed records, had nine top fuel eliminator titles and turned in 12 top times at drag racing events, according to the Colorado Motorsports Hall of Fame. High-altitude racing milestones were difficult, but Bockla was king of the mountain. "He was the first over 170, 180, and 190 mph," said Greg Sharp, curator of NHRA Motorsports Museum in Pomona, Calif. "He beat the legendary Don 'Big Daddy' Garlits in a match race in 1965 at 207 mph after Garlits announced on TV that 200 was impossible in the thin air." Sharp grew up idolizing Bockla. "I first saw his name in Hot Rod magazine when I was a kid in 1959." Snohomish resident Jeff Pocha calls Bockla "a legend." "When I was a boy, my dad and I spent quality time together always at the racetrack," said Pocha, 52. 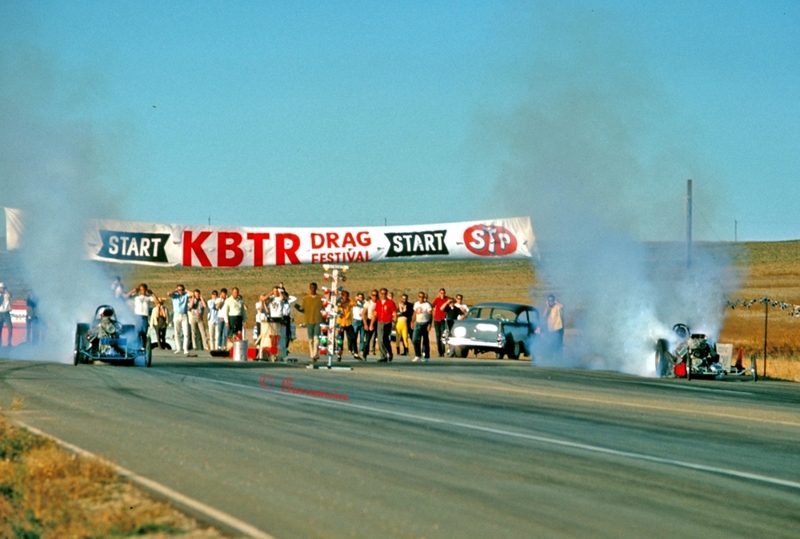 "Drag racing was kind of in its infancy. When anybody would break a record, their name went down in the record books and you'd never forget it. Alan Bockla was the one to beat." He recently met the legend in person. "It was such an amazing deal," Pocha said. "It was like running into John Wayne." Bockla's top speed was 228. "They're going 330 now," he said. 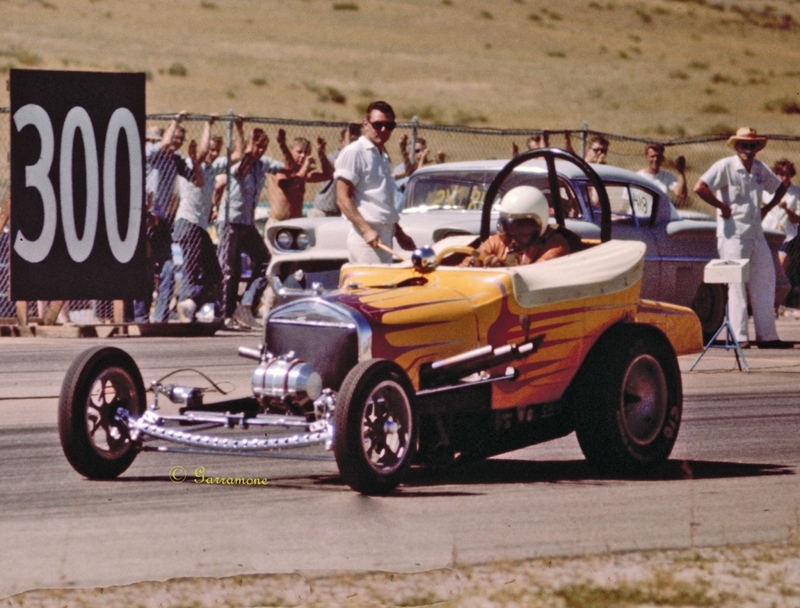 He raced coast-to-coast, pulling his hot rod on a trailer behind his Suburban. "I'd win one or two and lose two," he said. "The most I ever made was $46,000 in one year. It cost me more than that to maintain the car." He knew what to do behind the wheel. Other places, not so much. "I'd send money home. It's a lonely life. It cost me my marriage," said Bockla, a father of two. "I told my wife I was going down to the drugstore to buy some cigarettes and came back nine weeks later. We didn't get along too good after that." Bockla was a one-man show. 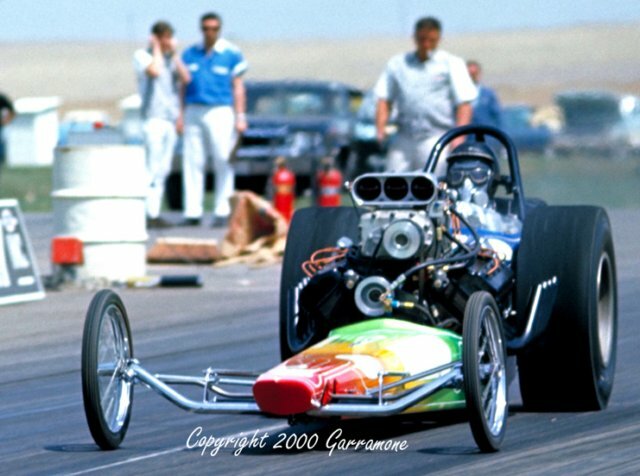 "I was at this race once and I ruined a cylinder head and I went to a junkyard there in Great Bend, Kansas, and got the head off a rusted old engine that was sitting in the back of the lot," he said. 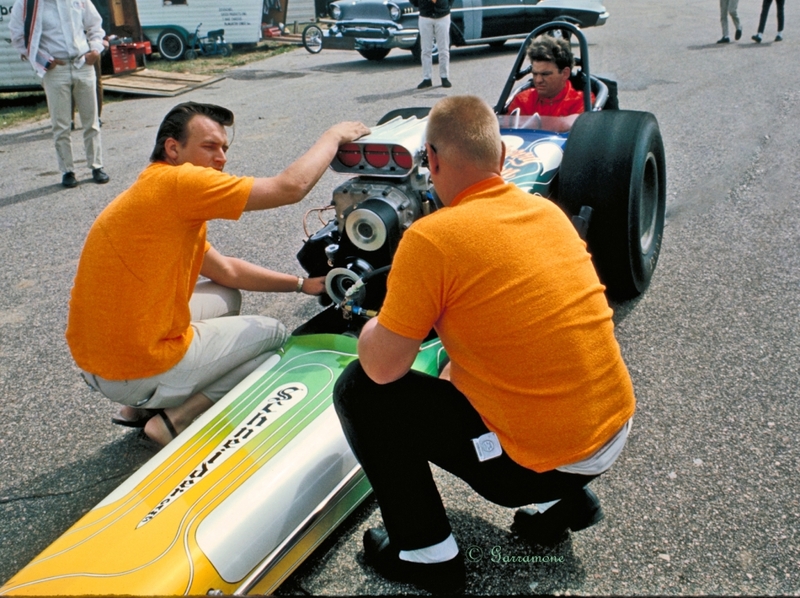 "Took it back to the hotel, filled the bathtub full of gasoline, cleaned it all up and put it on my race car. And it went 190 miles an hour." Those days of junkyard parts are over. "It's all special stuff. Cylinder heads now on the race cars are $20,000 for a pair. I could build a car for $18,000 or $20,000," Bockla said. "It's more of a downright business now. You have about a 12-man crew where each guy does something different. It's too professional. Too predictable what's going to happen." Money can buy speed, but not talent. "It's all instinct," Bockla said. "You gotta know what to do. I guess that separates the good ones from the bad ones. You gotta know what to do." 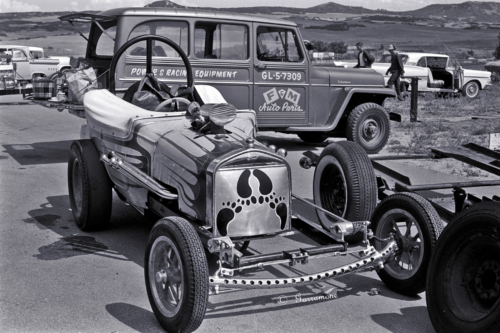 Bockla's drag cars were long, low, spindly, scary-looking vehicles, with skinny motorcycle tires on the front and chunky racing tires on back. 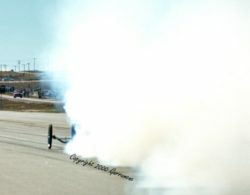 He sat in the roll cage, looking like the bad guy -- masked, gloved and helmeted -- stirring up a cloud of smoke on the quarter-mile straight strip track. 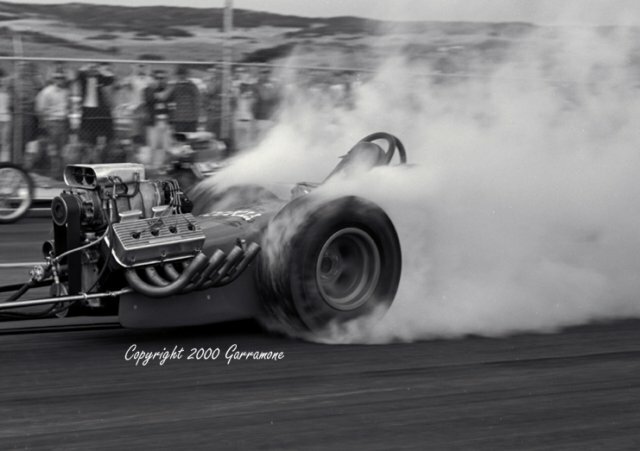 "Tire smoke," he said, "from spinning the tires." A parachute cord saved him from ripping into cornfields. "You'd pop it at the finish line," he said. Racing clothes saved his skin, most of the time. "I wore fireproof underwear, fireproof suit, fireproof shoes," he said. "I've been on fire quite a few times. I got burned real bad on the neck once." Cheating death was part of the rush. 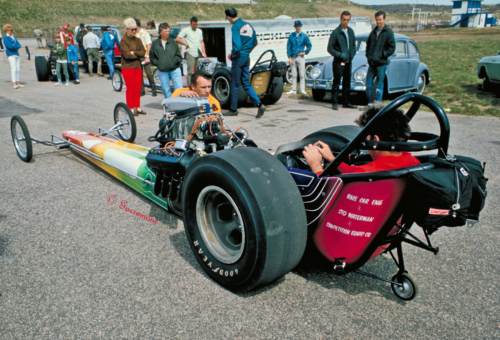 "When I was racing, the motor was sitting right in front of you. You get a face full of hot oil when the engine blows up and can't see where you're going. I've done that many times. It's no fun. Yet it is. I'd do it again," he said. 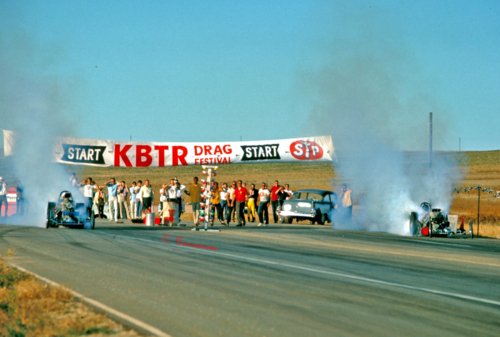 The crash of his career was in a car going 197 mph. "It took off like an airplane. It peeled off and started bouncing. It flipped over and skidded for a long time," he said. "They cut me out with a torch. The roll cage was all smashed. I was in the hospital for four days. I had a concussion and broke my wrist. I was pretty lucky." Mounting bills forced Bockla to quit racing in 1971, but he stayed in the biz. 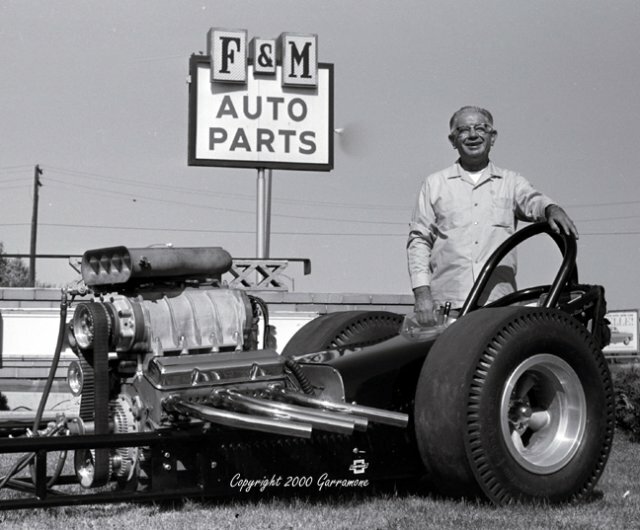 He took over ownership of his dad's speed shop, F&M Auto Parts in Denver, until 1998. Around that time, he started having early signs of Parkinson's, along with other troubles. "I got mixed up with this one girl and it was a disaster. We did drugs. I went through a million and a half dollars in four years. I was no angel, but I wasn't nothing as bad as she was. I had to get away," he said. He left Colorado in 2000 to be near his daughter in Edmonds. "I had $37 in my pocket and the clothes on my back. That was it. I haven't touched them drugs since 1999," he said. In 2006, he moved into a one-room assisted living unit at Everett Plaza, where he doesn't have to worry about cooking, cleaning or laundry. Racing photos cover his walls. Everything else is gone -- the fan letters, newspaper clippings, even all his trophies. "When I got divorced, my ex-wife threw a lot of them in the trash," he said. He hooked up with the girl upstairs, Jeannie Peterson. The paratransit bus takes them downtown two days a week to Full Life, an adult day health center, for exercise and activities. Other days, they hang out in his room watching "Perry Mason" reruns and sports on TV. 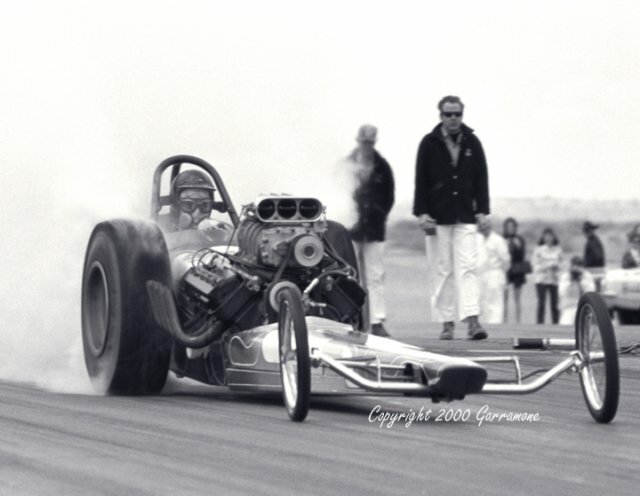 Peterson often went to drag races back in the day in Minnesota. "I can't remember if I saw him or not. I'm pretty sure I did. That was 50 years ago," she said. Bockla is losing the race with Parkinson's. "That damned Parkinson's. You never get rid of it," he said. "I take 17 pills a day. Each one does something different. You take pills that counteract what other pills do to you. Some mornings I can't even get out of bed and some I can jump right up and shave or trim my beard." It's a blow to his ego. "I got that Parkinson's shake and it's really embarrassing," he said. Last time he drove a car was in 1998. He misses racing more than driving. "Racing is the ultimate. There's nothing like racing. It's a thrill. It's a high." He got to relive some of the limelight on a trip to Denver several years ago for the unveiling of the restored "Alan Bockla" car. "I signed autographs for two hours," he said. He signed autographs again a few weeks ago when the assisted living center put on a car show. 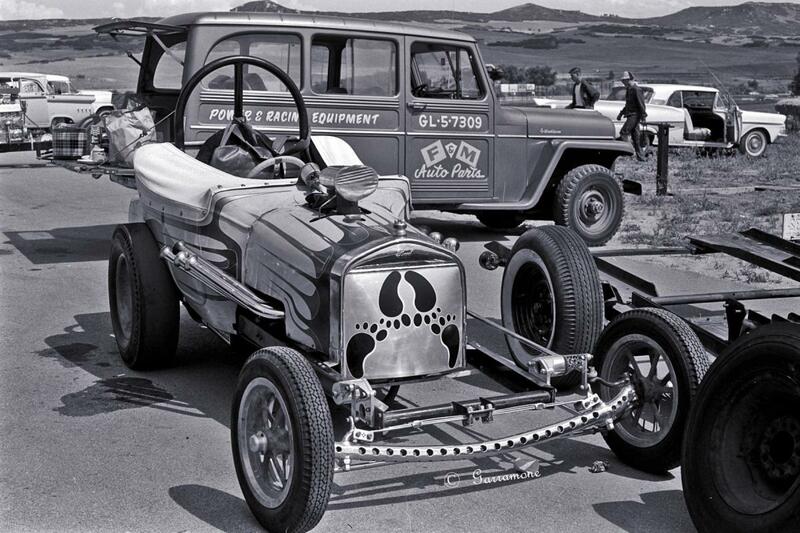 Bockla looks back at his racing heyday with pride. "It was good times, good memories. I broke a lot of parts and spent a lot of money, but it was well worth it," he said. "My grandkids think I'm a hero."